Fraudsters posing as a customer and making purchases with a stolen card or payment credentials. Fraudsters making purchases using another person’s retailer account information (e.g. username/password). Fraud perpetrated by abuse of the chargeback system or unintentional purchases. As consumer shopping volume continues to shift to digital channels, fraudsters have focused their efforts on identifying and exploiting the unique attributes of e-commerce. Meanwhile, increasing e-commerce fraud losses and management costs are taking a toll on merchants—and impacting their holiday revenue. 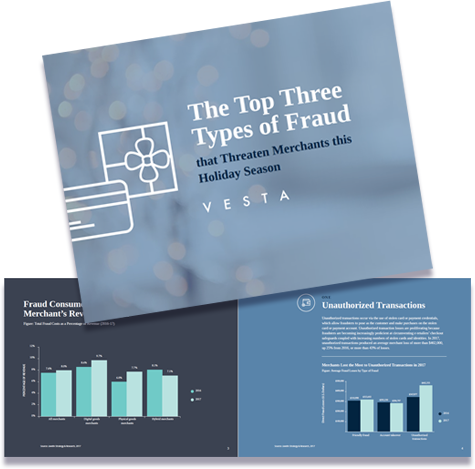 Read this eBook to learn more about the three major fraud risks that threaten merchants this holiday season. More than 20 years of delivering proven, scalable guaranteed payment solutions. Sales Inquiries to learn how.